A group of Chinese dissidents has founded a new party that challenges the dictatorship of the Chinese Communist Party (CCP) and advocates Shanghai independence. Since Xi Jinping took office in 2012, the Chinese government has tightened its grip on civil society and the media, cracking down on free speech, hardening its stance towards Taiwan and launching an all-out assault on Uighur society. However, the Party's increasingly oppressive policies are causing a backlash. In the United States a group of Chinese dissidents have formed the Shanghai National Party (上海民族黨), also called Humindang (滬民黨), from the character Hu (滬), the short name for Shanghai. The party, registered on July 18 in New York, United States, promotes the overthrow of the Communist regime and the independence of Shanghai. The slogan of the party is: "Leave China, return to Europe, comprehensive Westernization" (脫華歸歐，全盤西化), a reference to Shanghai's past as a meeting point between East and West. After being defeated in the First Opium War, on August 29, 1842, China was forced to sign the Treaty of Nanjing with the United Kingdom. The treaty stipulated the opening of five ports - Guangzhou, Xiamen, Fuzhou, Ningbo and Shanghai - to foreign trade (Rodney Gilbert and H. E. Morriss, The Unequal Treaties: China and the Foreigner, 1976, pp. 116-118). Shanghai was formally opened to foreign trade on November 17, 1843. The first British merchants founded what later became the International Settlement, a strip of land north of the Chinese city where foreign subjects enjoyed extraterritorial rights. By the turn of the century the area was inhabited by people from various countries: the UK, France, the United States, Japan, Germany, Russia, India, etc. According to a census in 1925 the International Settlement had 810,299 Chinese and 29,307 foreign residents. During the Second World War, the foreign concessions reached a population of 2,430,000 (see Shanghai Sojourners, ed. Frederic Wakeman, Jr. and Wen-Hsin Yeh, 1992, p. 1; and Jiaming Sun, Scott Lancaster: Chinese Globalization: A Profile of People-Based Global Connections in China, p. 61). In the early 1920s a new Westernized Chinese elite emerged in Shanghai, consisting of bankers, industrialists, businessmen, lawyers, accountants, managers etc., some of whom were educated overseas (Wen-Hsin Yeh, Shanghai Splendor: Economic Sentiments and the Making of Modern China, 1843-1949, 2007, p. 30). 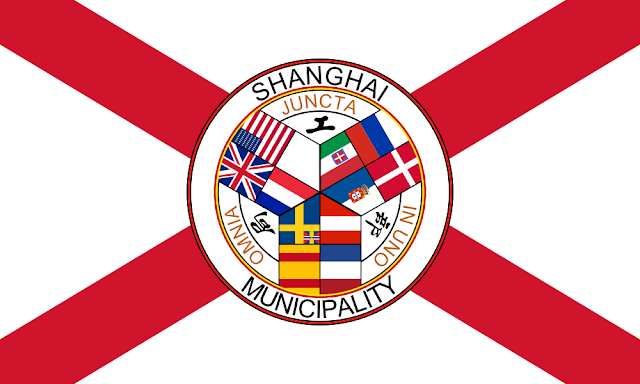 The Shanghai National Party draws on the city's international tradition, also shown by the fact that the symbol of the party is based on the flag of the Shanghai International Settlement. In a video He Anquan (何岸泉), Founding Board Member of the Shanghai National Party, said that the future of China lies in "separatism" (分裂) and the future of the Chinese people lies in the creation of independent countries for each nation (各民族獨立建國). The party opposes the central government's doctrine of the "great unity" of the Chinese nation and supports independence movements in Tibet, Xinjiang, Taiwan, Hong Kong and Inner Mongolia. However, the party does not seem to have many supporters. As of August 12, its official Twitter page only has 2,255 followers. But the news of the Party's founding has been widely reported on Taiwanese media.